VpCI-422G is a modification of VpCI-422 and is recommended specifically for removing rust from galvanized steel. It will not harm skin or adversely affect most paints, plastics, wood, textiles, ceramics or rubber when used as recommended. Removing corrosion from metal is easy. Just apply VpCI-422G to galvanized steel and rinse with water. VpCI-422G is completely organic, 100% biodegradable and does not require special disposal for typical use. It is especially helpful for outdoor and marine applications where chemical waste disposal can be a problem. In rare situations, waste treatment may be required if a sufficient quantity of pollutants are introduced to the chemical solution. Unlike conventional rust removers, which can be extremely dangerous to use, handle and store, VpCI-422G is so mild that minimal protective covering is needed. In addition, the non-toxic, non-flammable formulation has no pungent acid or caustic fumes. 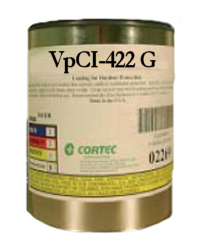 Being nearly odorless and extremely mild makes VpCI-422G easy and safe to use. In contrast to harsh industrial chemicals, VpCI-422G can be used in labor-intensive areas such as continuous assembly and packaging lines with no adverse effect on production efficiency. Weight per Gallon: 9.3 - 9.6 lb./gal. Available in 5 gallon steel pails (Cortec Product Code 11600107) or 55 gallon metal drums (Cortec Product Code 11600108). 5 gallon drum weighs 50 pounds and ships under our standard shipping rates. The 55 gallon drum must be shipped by truck. We will provide you with a freight quote before we ship this product. Store product in a heated warehouse to avoid freezing. Minimum storage temperature: 32 degrees F (0 degrees C) and Maximum storage temperature: 120 degrees F (49 degrees C).